Dancy Mandarins have a long history in the ever evolving world of citrus here in the U.S.. They can trace its origin all the way back to a seedling tree growing in the orchard of Colonel G. L. Dancy of Orange Mills, Florida, in 1867! However they might go even farther back than that, as they are believed to have been introduced from Tangiers, Morocco, giving rise to the familiar citrus term "tangerine" which now refers to all varieties of mandarins. However the story goes, you can create your own bit of history by planting your own Dancy mandarin tree, and enjoy this sweet/tart tasting, easy to peel, citrus fruit for years to come. 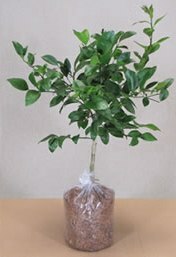 When using this page to order one of the citrus trees listed above, please indicate in the "COMMENT" SECTION (on the bottom of the "Billing Information" page) which variety of tree(s) you wish to purchase. We will not have any other way to know which tree you want.